Comfrey is native to Europe. The large leaves of comfrey are primarily used as a cut and drop mulch. Comfrey has a long tap root that is able to take up minerals from deep in the soil profile that other vegetable crops can't reach. The minerals are bio-accumulated in the leaves and are released back into the the upper layers of soil as the leaves break down. Comfrey leaves have a high nitrogen to carbon ratio which means they can be dropped directly onto your growing beds without requiring composting first. 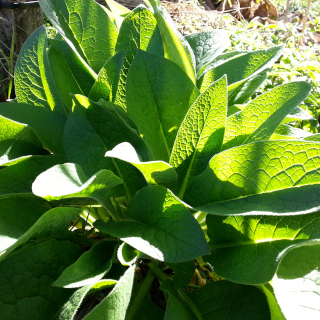 Despite its use in some medicinal preparations, comfrey should not be eaten as it may cause liver damage. In Australia sow comfrey seeds early Autumn (March) or during Spring (September to November). Sow comfrey seeds 5mm deep spacing plantings about 50cm apart to provide enough room for their large leaves to grow. Comfrey can be slow to germinate, taking from 10 to 28 days to emerge. Cold stratification can improve germinate rates, to do this mix the comfrey seeds with drained damp sand in a zip lock bag and refrigerate for a week prior to sowing. Plant comfrey in a location that receives full sun or light shade. To ensure vigorous growth is ongoing supply an organic nitrogen fertiliser every time the leaves are harvested, well rotted manure or garden compost can be applied as a side dressing to achieve this. Comfrey will start to flower 6 to 12 months after planting.